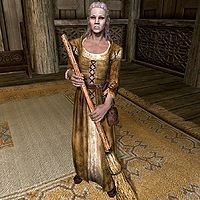 Fianna is a Breton who works as a maid in Dragonsreach. Fianna works alongside fellow servant Gerda and they both spend the entire day sweeping the floor in the waiting area in front of the throne room. At 8am, Fianna starts sweeping the northwestern area, while Gerda sweeps the adjacent area. At 2pm they switch places and they both keep sweeping until 8pm when they head downstairs to their humble rooms in the Jarl's quarters. The entire night is spent either wandering, relaxing or eating, despite the presence of a bed nearby (see bugs). Fianna wears a belted tunic along with a pair of boots. She also wields an iron dagger. Fianna takes her job very seriously and even if you become a thane she will remark, "Ain't nobody here high and mighty exceptin' the Jarl and don't you forget it!" She will also make sure to tell you: "Don't you go trackin' your dirty boots on my clean floor!" She will also point out her disliking of the increased number of soldiers: "Soldiers! They're everywhere these days. And not a one of them knows how to pick up after themselves." Fianna was supposed to sleep from 8pm to 8am, but her sleep package mistakenly includes other activities, causing her to stay up all night. Skyrim-Factions-During sieges, staff and family hide. This page was last modified on 12 December 2013, at 23:06.